When surprised by the visit of a long lost friend, Lucille, one of our characters in Far From the Tree says, “You never know what a day will bring.” It’s one of the lines we quote often (it has been a blog title before and will likely be again), and it sure was true this weekend. We drove to Cincinnati to sign books at the Author’s Pavilion at the NAACP National Convention—nine hours each way, and yes we sang in the car. Literally as we were walking out the door on Thursday, Virginia remembered that Madeline Moxley, a friend we met in 2000 and with whom we have been in contact through the years, but haven’t seen in quite a while, lives in Cincinnati, and she emailed Madeline to say we’d be in town and hoped we’d be able to grab some time together. We knew it was last minute, and who doesn’t have plans for 16 more things than any one person can do on the weekend, but we figured it would at least bring a catch up email. Well, Madeline called on Friday during our drive —not only would she be able to see us, but she wanted to know if we’d be up for a brunch—she was organizing it with the Urban League of Greater Cincinnati, where she works. Who can make time for brunch on 24 hours notice? 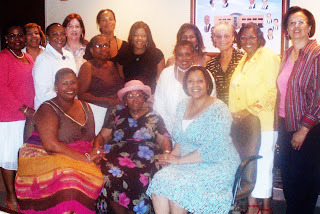 How about a room full of women, including the president and CEO Donna Jones Baker! We were stunned and honored and had a great conversation with all who attended. And the biggest surprise was two of the attendees—Gloria King Darby and Mrs. Forney, Regina King’s mother and grandmother. Talk about a small world—turns out Madeline and Gloria have been friends for years. We always credit family as a big reason why we are who we are in this world. We have met, or at least spoken to, most of the families of our producing partners and it feels good to know their support is with us as we go forward with our film ventures. So we thank Madeline for inviting them, and Regina, who is slated to play Gayle in Tryin’ to Sleep in the Bed You Made, for sharing her Mom and Grandma with us. Those hugs sure felt good. 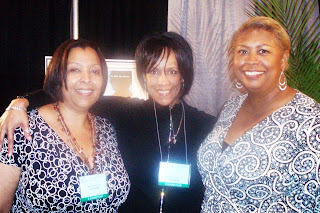 We had a wonderful time with our sister author friends—Victoria Christopher Murray and Marissa Monteilh and talking to the folks who attended the NAACP Authors Pavilion. 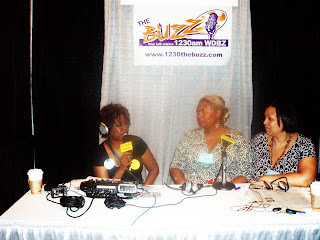 We also got the chance to spend a little on-air time with WDBZ-AM's Jeri Tolliver -- another avowed book lover. Books are such an important part of the African-American experience. Kudos to Mocha Ochoa and her great team for her second year of putting it all together. We’ll have a video to share soon. This was the 99th convention. The NAACP will celebrate its 100th anniversary next year in New York. We look forward to being there. This Thursday we’re back in the car shuffling off to Buffalo to host the first annual Buffalo Book Awards at the Buffalo Book Fair. We gotta remember to change the tunes in the CD player, so we can keep singing. 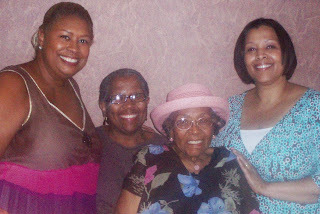 Us with Regina King's mom Gloria King Darby and her grandmother, Mrs. Forney.